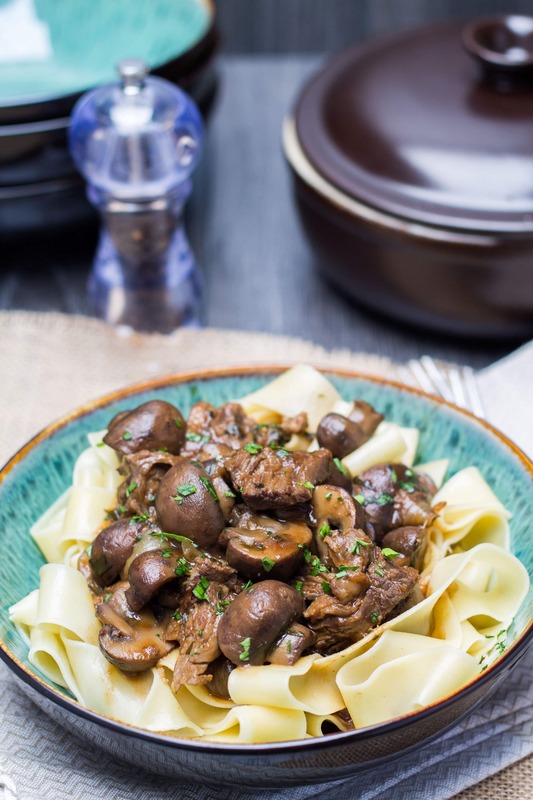 This recipe for Slow Cooker Beef & Ale with Mushrooms is a comforting classic. 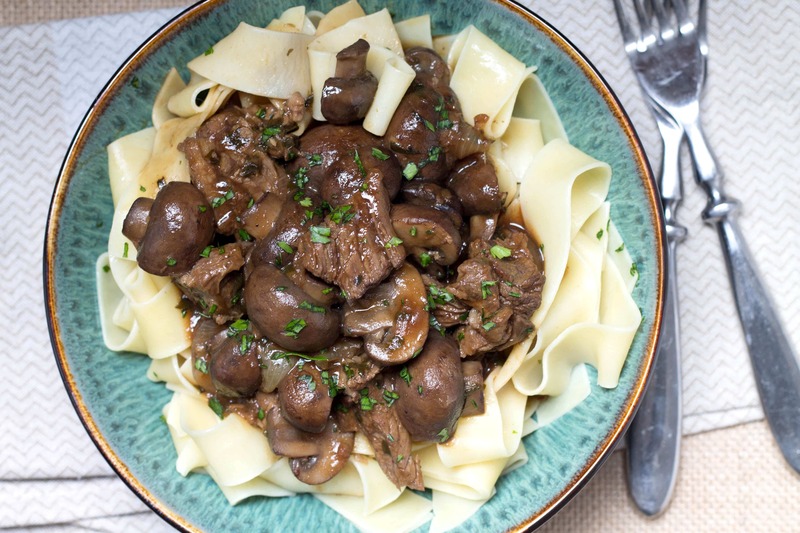 It's slow cooked with tender meat in and dark rich gravy. There’s nothing like a hearty beef and ale stew to warm you through when it’s cold outside. 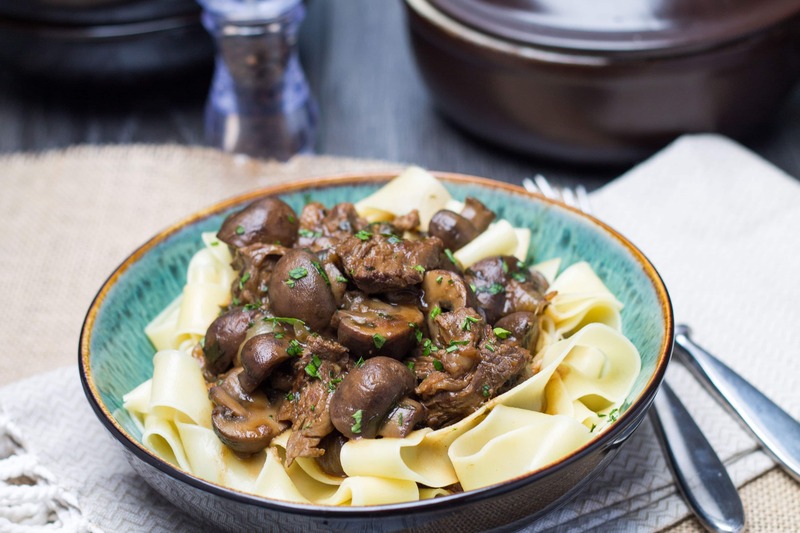 This recipe for Slow Cooker Beef & Ale with Mushrooms is a comforting classic – this version is slow-cooked resulting in tender meat in and dark rich gravy. 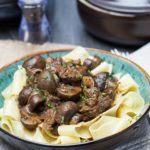 I love slow cooked meals this time of year, but I sometimes run into trouble with slow cookers and knowing how much liquid to add. Because slow cookers have a tightly sealed lid, the liquid doesn’t evaporate so when adapting a standard recipe, I find it’s best to reduce the liquid by about a third. The liquid should just cover the meat and vegetables. You also shouldn’t overfill your slow cooker. Half to two thirds full is perfect. So when I started working on this recipe I wasn’t sure how to get the flavor without adding too much stock. So, I cut the stock completely and used just one bottle of beer to cook the meat in. The result was gloriously tender beef and a sauce that was packed with a rich flavor. I also add the thickening agent at the end, take the lid off and raise the temperature for the last half hour. That way, the stew doesn’t end up more like a soup. 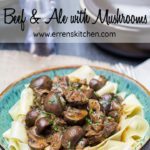 Place the mushrooms in a microwave safe bowl and cook on high heat for 3 minutes to release the water. Strain and set aside. Heat 3 tablespoons oil in a large pan on medium-high heat. Start by browning the beef in batches on all sides. Add to the slow cooker. Using the same pan, add more oil if needed. Soften onion and celery. Add the garlic and cook another minute. Stir in the in the beer. Crumble in the stock cube and add the mushrooms and thyme. Bring to a boil, then add the mixture to the slow cooker with the beef. Season well with salt and pepper. Cook on low 8-10 hours. the before serving the remove the lid. Add the flour to the water and mix until no lumps appear in the mixture. Mix into the stew and cook uncovered for 30 more minutes on high – this should thicken the sauce nicely. Stir in the chopped parsley and serve over, noodles, rice or potatoes. This recipe looks delicious but I have to ask, 4 pounds of beef for only 4 servings—is this correct? A pound of meat seems like a lot per person! So sorry Tibi, you’re correct. Was supposed to be for 6 people. Thanks for pointing it out. I’ll update as soon as I’m in front of my computer!